Thanks to Merritt Milam, Wags ‘N Whiskers offers top-notch grooming and boarding services for the furry residents of Birmingham and Homewood. While your beloved pet enjoys training, grooming or daycare, you can enjoy peace of mind knowing that they are receiving the best care in the best hands. How did you come up with the concept of a full-service pet care facility? I’ve been training dogs for 9 years and landed my first training job when I was just 17 years old. Everything I learned was based on positive reinforcement training methods, which I loved! 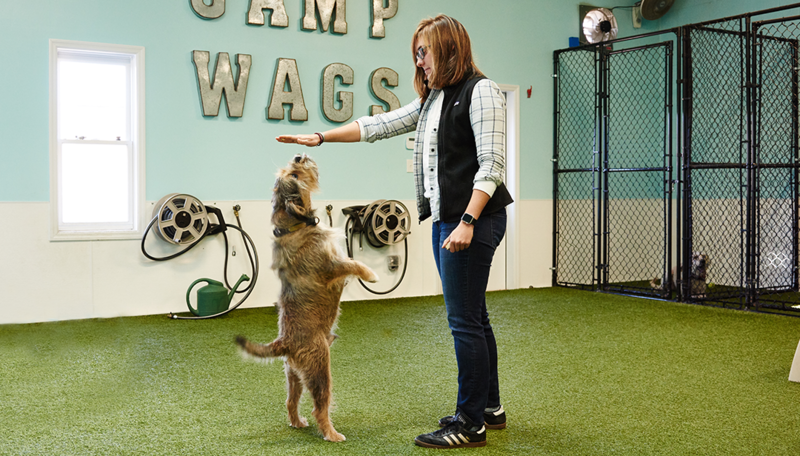 I also fell in love with behavior training, which focuses on being aware of a dog’s body language and is about as close as you can get to talking to them. I also worked at a few veterinarian offices as a technician and loved the medical side, but I missed the training aspect of the work. I started thinking about the concept of Wags ‘n Whiskers in February of 2014. Once I asked Jill (now the Director of Operations and Groomer at Wags) if she’d like to run a rescue through my facility, things really got rolling. We saw a need for solely positive reinforcement training facility and what is considered Daycare 2.0 (small groups with more personalized play) in the area. Our other services fell into play: with daycare comes boarding, boarding typically calls for grooming, and the Pet Taxi just sounded like a good idea! Why did you choose Homewood as the location for your services? I looked at 13 properties for Wag ‘n Whiskers, and our current location was the very first place I saw. I’ve always loved Homewood, and I saw a need for a positive training facility in the area. There were 12 other great locations, but they all paled in comparison to Crescent Avenue! We really couldn’t have selected a better location; we have such a wonderful clientele here! What is the funniest thing you’ve seen in doggie daycare? One of the funniest things we’ve seen in daycare is when one of the dogs decides to use our baby slide on their own. We added the baby slide to the yard more for our counselors’ entertainment — typically, they will roll tennis balls down the slide for fetch or watch campers climb on the end of it — but we ended up having dogs that really enjoyed getting to the top and sliding down on their own! We didn’t see that coming! I have 6 pets, all of which are rescues. I have three dogs — Milo, Enzo and Gus — and three cats — Wiley, Bell and Sheldon. Does Wags ‘N Whiskers have any events planned for the summer? Summer gets pretty crazy at Wags! Daycare stays full and that always means lots of fun groups for our campers. In the past, we’ve had a “Back to School” party in August — that tends to be a favorite for our counselors and pet parents, so our clients can look forward to that in August!